By the time they hefted their wooden packboards by the leather straps and hoisted heavy loads onto strong shoulders at the top of Mount Washington last July, the trail workers were in woods shape. They’d started the summer by patrolling 360 miles of Appalachian Mountain Club-maintained trails in the White Mountains, cutting hundreds of wind-toppled trees and untold amounts of brushy blowdown off the treadway. They’d spent a few more weeks building stone staircases and water bars on trails in the region. 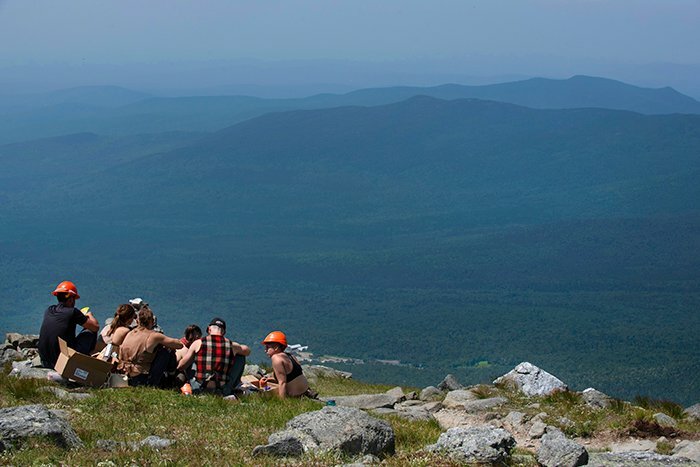 Now, this six-person contingent of the Appalachian Mountain Club’s White Mountain Professional Trail Crew was on assignment in the alpine zone, working to improve the much-used Crawford Path. Their packboards — tall wooden frames fit with hooks along each side, allowing the carrier to affix everything from sleeping pads and a week’s worth of food to axes and buckets — seemed the only semblance of standardized dress code. Crew leader Coupons and second-year crew member Wrench donned button-down shirts and plaid wool vests this Monday morning. Jax had her hair pulled into a neat ponytail and paired a silky dress vest with rugged work pants, while Misty of Chincoteague (just Misty for short) sported a pinkish-orange mohawk, and Crush opted for a one-piece Dickies suit, which she said keeps pebbles from getting into her clothing. The names are “woods names,” acquired organically at the start of a member’s tenure on the Pro Trail Crew. When asked about these names, the crew members respond with some version of, “It’s a long story,” and leave it at that. Some things, it seems, are for crew members to know and the rest of us to wonder about. Others aspects of the work are on clear display — including the large tattoo that occupies the entire back of Coupons’ head and features what he calls “The Trifecta” of the trail crew — ax, rock bar and pick mattock — a nod to the idea that some things never change, that this group of strapping young workers does similar work in much the same way as the first AMC Pro Trail Crew did 100 years ago. It seemed fitting that the crew, nearing the century mark of its founding, was at work on the oldest hiking trail in the country. The Crawford Path was built in 1819, running more than 8 miles from Crawford Notch over Mounts Pierce, Eisenhower, Franklin, and skirting Mount Monroe before its final section — part of the Appalachian Trail — climbs to the summit of lofty Mount Washington. The group of early-20-somethings, like 100 years of trail crews before them, was ready for the challenge. Their axes were sharpened, their muscles toned for the work, their heavy boots scuffed and well broken in. As they set off over the mountains in the July sunshine, it was not just trails they were out to maintain, but a tradition, a legacy of hard work in the hills. The 1924 AMC Trail Crew. The trail supervisor that year was Dana Backus (far right), who worked for AMC as did other members of his family, including his daughter Anne Converse Backus, who worked at Pinkham Notch Camp. After her tragic death in an auto accident in 1970, her family gifted the Garfield Ridge Campsite to AMC, and a plaque has been installed in her name. 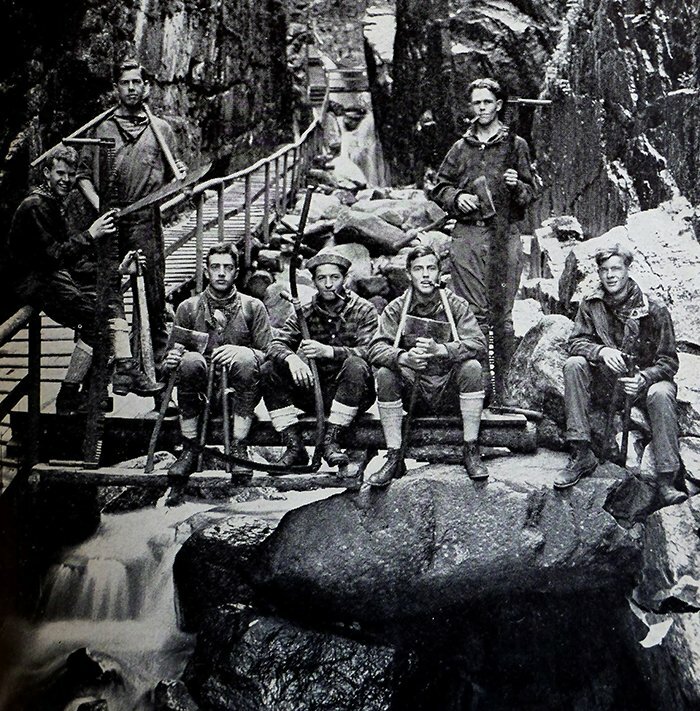 Back in 1919, realizing the need for ongoing maintenance of the trails that had been hewn through mountain forests in the preceding decades, the AMC’s Paul Jenks hired six high school students and three Dartmouth Outing Club members to form the first professional trail crew. The Dartmouth contingent included a 20-year-old Sherman Adams, who many years later would become governor of New Hampshire and eventually President Eisenhower’s chief of staff. Before that illustrious political career, however, Adams could wield an ax with the best of them. With little training, that first crew went into the woods to clear brush and improve trails. The following year, many of the inaugural crew returned, teaching new crew members the ropes as they worked through the mountains. And so it went, with some growth and changes — and more trails to maintain — from year to year, decade to decade, into the 21st century. That’s about 20 pounds, for the inquiring mind. With a steady increase in the number of hikers throughout the Whites, trails see considerable damage from overuse and erosion. The first crew of nine has expanded to 15 to 20 members each summer. Today’s crew spends much of its time improving trail drainage, filling in “social paths” where the trail is braided by hikers stepping off the treadway, constructing features like cairns and scree walls to guide hikers along the proper path, and building a durable surface that includes rock stairs. One of the constants through a century of the Pro Trail Crew is that experienced crew members train the newbies. Trail crew members, now typically college-aged, spend anywhere from one to four years on the crew. And they identify themselves by how long they’ve worked in the woods. Third-years are often crew leaders. The trail master is usually a fourth-year crew member. The crew normally has three summer-long projects to focus on, with the trail master overseeing all of them. Each crew leader is assigned one project for the season. The rest of the crew splits into three groups, whose members change each week, and work rotationally on each project throughout the summer. Crew leader Coupons, left, and second-year crew member Wrench, right, hoist second-year crew member Jax, who weighs far less than the boulders she can move. Pre-work training is minimal, and the primary requirement for landing a spot on the Pro Trail Crew is a willingness to work hard. Through the summer, the crew puts in 10-hour days, five days a week, conducting what seems exhaustingly physical labor. They move boulders larger — and several times heavier — than the people moving them, fit stone steps precisely into place, and pin them with other stones. They chop, shovel and heave from morning to evening, through heat, humidity, cool breezes, fierce winds, black flies and all. With few exceptions, all the work is done with tools the crew carries into the woods on their backs and materials they find near the trail. Boulders for stone steps are quarried from the woods. Trees are sometimes sawn to build bridges. Brush is cut and carried to fill in social paths detrimental to the integrity of the trail. In the alpine zone, that becomes even more challenging. Extreme care is taken to leave delicate vegetation near the trail untouched. Rocks can only be taken if they sit on other rocks — not if they are directly on soil. Crew members avoid stepping on plants, leaping from rock to rock as they work. Despite the grueling work in sometimes harsh conditions — or, perhaps, because of it — crew members seem to relish their days on the trail and take pride in the end result. More than 50 years ago, when the White Mountain Professional Trail Crew was half the age it is now, a four-year crew veteran shared his experiences in the December 1966 edition of the AMC’s journal Appalachia. While the Pro Trail Crew normally works on its own, with an array of volunteer and professional crews contributing to maintaining other trails throughout the state, 2018 marked a large collaborative effort as crews combined forces to spruce up the Crawford Path prior to its bicentennial year. The effort involved a $150,000 grant from outdoor outfitter REI (Recreational Equipment Inc.) to the National Forest Foundation, which Urgese says is an amount “unprecedented in our world of trail-building in the Whites.” The effort included the Pro Trail Crew, as well as AMC volunteer crews, US Forest Service crews, Randolph Mountain Club, the Vermont Youth Conservation Corps, Dartmouth Outing Club, Student Conservation Association New Hampshire Corps and the Cardigan Highlanders. The Pro Trail Crew spent a week in the alpine zone working on the 1.5-mile section of the path between the summit of Mount Washington and the AMC’s Lakes of the Clouds Hut, tackling tasks one by one. On the first day on high, Misty and Crush (Katie McCahan), both first-years, filled milk crates and 5-gallon buckets with fist-sized rocks and carried them to a social path that needed to be filled, and would eventually be covered with a scree wall to encourage hikers to stay on the trail — and off the vulnerable alpine vegetation. Smathers joined them, offering advice as needed. Comparing calluses — clearing trails and moving stone is hard on the hands. Combining an eye for the artistic with smarts and pure determined strength, second-year crew member Jax (Lucy Milde) painstakingly dismantled a rock cairn, one stone at a time, and relocated it to a place the crew determined would be more effective in guiding hikers along the proper path. Another second-year, Wrench (Finn Mahoney), leveraged his trail tools to begin moving rocks toward the construction of a stone staircase. Coupons (Colin Pogue) helped wherever he was needed, all the while keeping a lookout for large chunks of quartz to include in the cairns. At week’s end, the crew moved on to other projects — working lower on the Crawford Path, as well as on the A-Z Trail near Crawford Notch and on a section of the Appalachian Trail in the Mahoosuc Range near Berlin. Urgese says the AMC plans projects several years in advance to ensure funding — from grants and the AMC budget — and maintain the heaviest-use trails as well as possible, all while adjusting schedules to deal with variables like storm damage and occasional vandalism to trail signs and cairns. 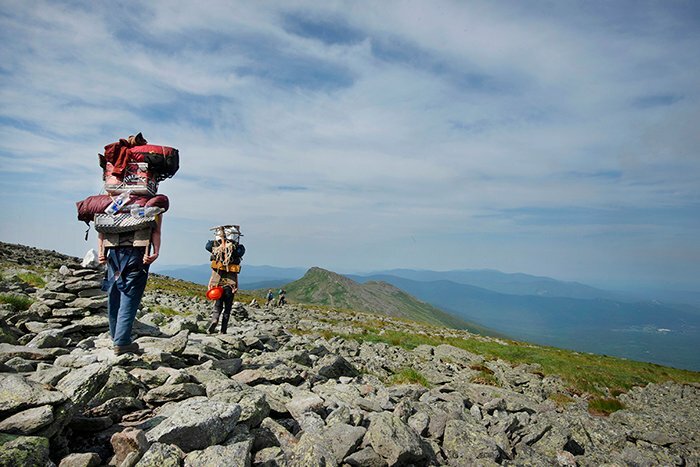 A ton of work, hundreds of miles of trails, countless hikers trekking through the mountains. And a 100-plus-year procession of young people willing to spend their summers in the woods wielding rock bars and axes so those hikers may more easily make their way from valley to summit, across the mountains and back again.